The capacity of the Leading 7800 is most impressive; with four main tanks totaling 800 bushels in capacity yet minimizing compaction. The L7800 has many new design features that take it to the next level in leading air seeder design! 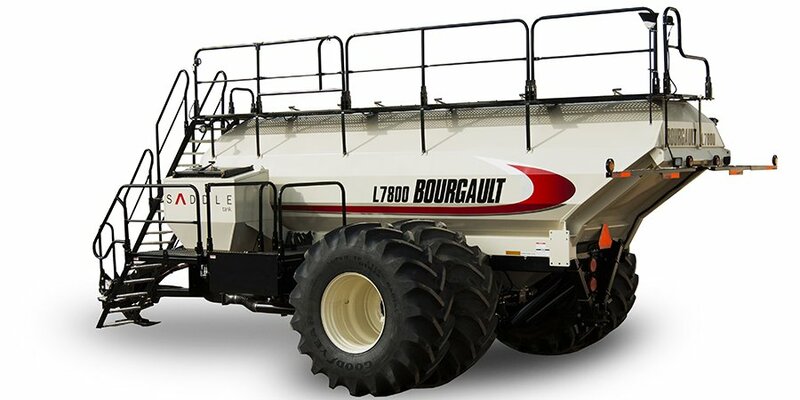 The capacity of the Model L7800 is most impressive, with four main tanks totaling 800 bushels (28,191 litres) and full inter-tank flexibility that Bourgault air seeders are renowned for. The Bulk Boom option makes loading bulk bags of seed, fertilizer or inoculant both more convenient and efficient. The optional 40 Bu Saddle Tank & Pallet Storage Platform mounted on the left side of the L7800 is designed for the seeding and storage of bagged product and raises the total tank capacity to 840 bushels (29600 litres)! Bourgault offers the Product Lift System for convenient transport of seedbags to the tank top (not available with the Saddle Tank). Huge, 850/80R38 radial lug tires require a low 18 psi (124 kPa) inflation pressure, even when operating fully loaded. Compaction is minimal and farmers can continue to fill the compartments even in wetter seeding conditions. The 90" tire diameter minimizes rolling resistance which is important for a tank this size. Brakes are standard with this large tank. The L7800 is available with a 12" diameter Deluxe Auger. Staircase access features grated cast steps. Depending on your priority, 7000 Series air seeders have two different seed application controllers. For those Operators wanting extreme capability, Bourgault offers the ISO/X30 Apollo System*. The X30 Apollo System provides unprecedented control of the L7800. Alternatively, Bourgault offers the ISO Apollo System which provides basic control for those individuals who wish to use the Virtual Terminal in thier tractor. The L7800 comes standard with a stand-alone camera system and a 7” (18 cm) LCD screen. Each tank compartment is equipped with a separate camera to monitor product levels and a rear view camera allows you to watch for approaching vehicles when transporting from field to field. The PDM Pro, Bourgault's newest metering auger design is standard equipment on L7800 Air Seeders. Standard load cells reduce your filling times by eliminating overfilling when only partial fills are needed. The Leading 7800 may be ordered with additional packages for use with air kit blockage kits, or Auto Section Control. Auto Section Control plus Blockage Ready Kit - this package provides a harness that runs from the air seeder ECU to the air seeder rear tow hitch, that connects to the blockage harness from the drill. It also includes the hydraulic hose required to run the ASC manifold valves located on the drill. Blockage Ready Kit - this package provides a harness that runs from the air seeder ECU to the air seeder rear tow hitch, that connects to the blockage harness from the drill.